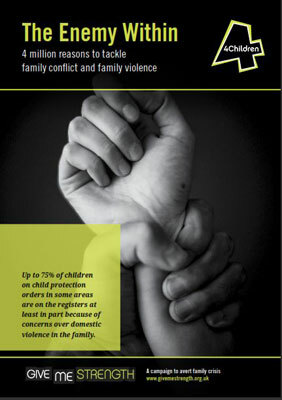 Children and families charity 4Children has today published a report into family conflict and violence, as part of its Give Me Strength campaign. The report, The Enemy Within, includes the results of a survey of 1,018 parents with teenage children, carried out by YouGov for the charity. The survey found that 53% of families with children experience serious or frequent conflict, with 9% experiencing physical violence. 21% said that the cause of the conflict was worries over finances and debt. 1. That definitions of domestic violence should be widened "to fully encapsulate family violence", for example by including parent-on-child violence and adolescent-on-parent violence. 2. That family violence be made a high priority by both national government and local authorities, "to ensure that families receive the joined up support they need". 3. That a 'whole family approach' be introduced to responding to family violence by police and family workers, "to ensure that the whole family is strengthened and has the support they need to overcome their problems". earliest opportunity, and that opportunities for intervention are not missed". 5. That the impact of family violence be recognised in national initiatives, by making it a key measure in any 'payment by results' scheme. 6. 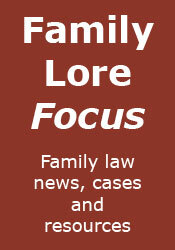 That there be a move to an early intervention approach, "to prevent family violence and crisis". The report can be read here. You can also read about it in The Independent and at Children & Young People Now.